Kathmandu, Nepal. 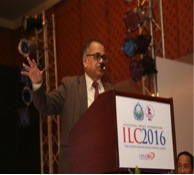 Professor Kazi Nurul Islam served as the moderator at the 4th Session entitled “Overcoming Extremism and Promoting the Peaceful Resolution of Conflicts” during the International Leadership Conference with the theme “Addressing the Critical Challenges of our Time: The Role of Government, Civil Society and Faith-Based Organizations” from July 28-31, 2016. The Program was jointly organized by the Universal Peace Federation, Parliamentary Peace Council, Nepal and the Ministry of Peace and Reconstruction, Government of Nepal. There were more than 700 participants including one Prime Minister, two former Presidents, one former Vice President, eleven Ministers and 311 Parliamentarians from 29 nations. In addition, there were leading representatives from Faith-based organizations, members of the Civil Society and media from Asia Pacific. The Prime Minister of Nepal, His Excellency KP Sharma Oli inaugurated the program. At the 4th Session, Prof. Izlam (Muslim), of the University of Dhaka, has moderated the discussions among highly reputed religious leaders, scholars and well-known interfaith activists. Among the leading peace advocates in the Session were Dr. Shivacarya Shivamurty Mahaswamy, (Hindu) Spiritual Head, Sri Taralabaher Jagatguru Brihanmath, India; Acharya Dr Lokesh Muni Ji, (Jain) Founder, Ahimsa Vishwa Bharati, India; Dr Naresh Man Bajracharya, (Buddhist) Vice Chancellor, Lumbini University, Nepal; Dr Thowrn Senneam, (Christian) Former Minister of Interior, Thailand; Dr. Dante Liban, (Christian) President, People’s National Movement Federation, Philippines; and, Honourable Seraj Muhammad Khan, (Muslim) Chairman, National Standing Committee of Commerce and Member of the Parliament, Pakistan. The 4th Session focused on the role of religions for peace building. The panel includes prominent interfaith leaders offering their strong advocacy for spiritual and religious activism to work for peace and prevent all forms of violent extremism. They called for moderation and mutual respect, stating that violence is not consistent with any religion. The Parliamentarians expressed their deep satisfaction to have a session that focused on the role of religious peace building. In his speech as the moderator Professor Kazi Nurul Islam stated that fanaticism leads to terrorism. There are four types of fanaticism: a. Political Fanaticism, b. Ideological Fanaticism, c. Religious Fanaticism and d. State Sponsored Fanaticism. All are equally dangerous threat to national as well as world peace. More or less almost everywhere in the world there is a threat of terrorism. In view of the various types of fanaticism, Professor Islam presented the following four questions for discussions and crafting of recommendations: 1.Where do the terrorists get inspiration from? 2. Where do the terrorists get funds from? 3. Who supply them with the most expensive and most sophisticated arms? and 4.Who are the beneficiaries of these terrorist activities? He emphasized that the answers to these questions will also pave the way on how to stop terrorism. Dr Islam boldly asserted that terrorists do not have any religion. They are neither Hindus, Muslims, Buddhists nor Christians. They are against every religion. They are enemies of peace and enemies of mankind. He has urged all the participants not to give up the hope of bringing peace on earth. We all should try to give our children, our students and our next generation, as far as possible, the real and ethical teachings of religions not only at home, but also at schools, at colleges and at other academic institutions. Dr Islam asserted that if we can make our future generations enlightened citizens of the world and if religions are not, under any circumstance, involved with dirty politics, then religious fanaticism, inter-religious hatred and their consequent terrorism in the name of religion will cease to be. 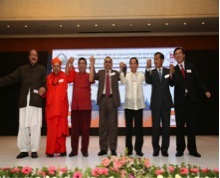 Dr. Islam has led the panel of speakers to take an oath of dedicating their lives to eradicate inhuman activities and prayed together so that peace prevails on earth as they raised their hands holding each other. Dr. Kazi Nurul Islam is delivering his speech as the Moderator of the session. Some distinguished participants of the Summit (from left to right) Dr. Kazi Nurul Islam University of Dhaka; Professor Dr. Zaleha Kamaruddin, Rector, International Islamic University, Malaysia; Sri M. Founder, Satsung Foundation, India; Dr. Santi Nath Chattopadhyay, Director, International Society for Intercultural Studies and Research Centre, Kolkata; Swamy Agnibesh, a renowned humanitarian philosopher etc.